SUFFERING from cramps, fatigue, swollen feet, aching legs, varicose veins, edema, shin splints or plantar fasciitis? Seeking to REDUCE recovery time and INCREASE blood flow? Aiming to IMPROVE your performance? Just completed surgery and seeking to REDUCE swelling? 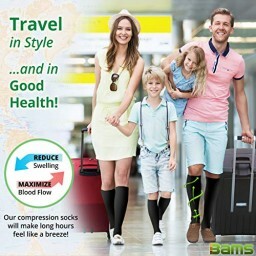 Love compression but DISLIKE the stinky odor? 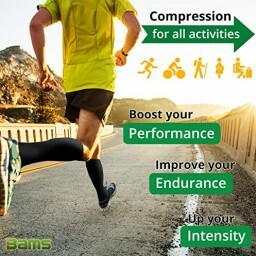 Performance: True, medical-grade compression clinically proven to reduce swelling, maximize blood flow and speed recovery time! Instantly relieve pain from plantar fasciitis, varicose veins and edema with the only medical-grade, hypoallergenic compression. Prevent DVT and reduce swelling from prolonged standing/sitting. 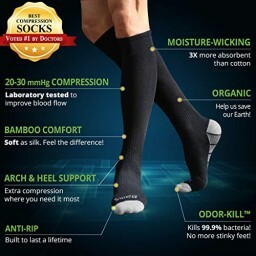 Bamboo Odor-Kill Technology:Our anti-odor fibers instantly stop bacteria/fungi for a 99.9% microbe reduction to your legs and feet! 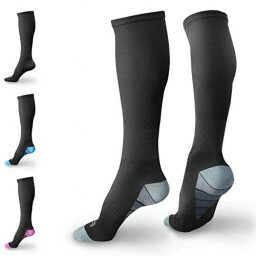 Enjoy compression that is 3X more absorbent than cotton/polyester socks. Say goodbye to toxic exposure of chemicals used in the textile industry that can irritate your skin! Our eco-friendly fibers are grown with 40% less water than cotton with no pesticides/chemicals for unrivaled comfort! BAMS 100% Risk-Free Satisfaction Guarantee: As a US-BASED company, we offer FAST customer service in proper English! When it comes to your health, trust us over foreign sellers.